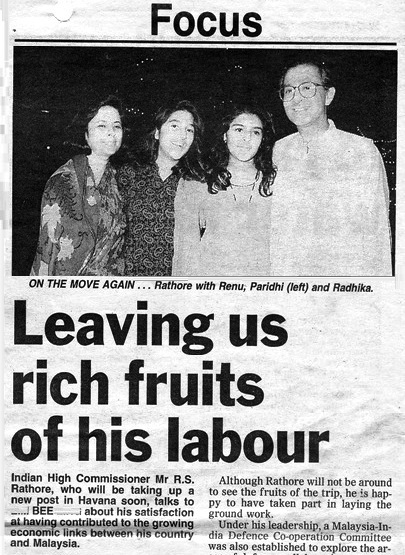 The Rathores hosted the open house on Tuesday, 27 October 1992; My article in The Star published on Thursday, 29 October 1992, page 10. 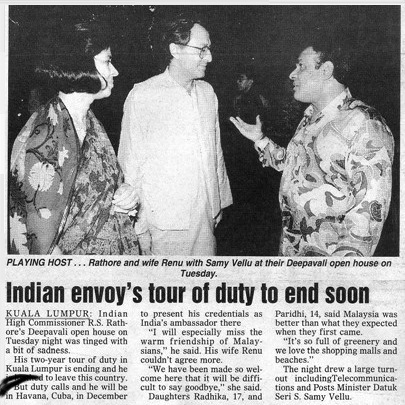 I was eventually granted an interview with HE Mr. Rathore just before he completed his tour of duty here; this article was published in Sunday Star on 27 December 1992, page 10. In US, at the Commonwealth Women’s Association meeting and lunch hosted by Mrs. Lekha Sreenivasan (wife of Indian DCM) at her home in Bethesda, Maryland, 26 September 2000. Seated L-R: Datin Kamilah Abdullah (wife of Brunei Amb), Mrs. Joan Bolger (wife of NZ Amb and former first lady of NZ) and Mrs. Khaleeda Shehabuddin (wife of Bangladesh Amb); Standing L-R: Mrs. Lekha Sreenivasan, Mrs. Meheera Yakub (Bangladesh), Pn. Jameah Kholil (Malaysia), Mrs. Zakia Mansoor Hussain (Bangladesh) and Mrs. Yvonne Salina (wife of Malta Amb). In HK at the HK Indian Women’s Club Diwali Afternoon held on 30 September 2009. This entry was posted in Articles, Forever Friends, Heavenly Hong Kong, Star Stint and tagged Articles, Friends, Hong Kong, India, Star, WashingtonDC. Bookmark the permalink.